I went for my first mani & pedi in June this year, it was an eye opening & unsatisfied experience which I told myself that I will NEVER step into another nail spa again. 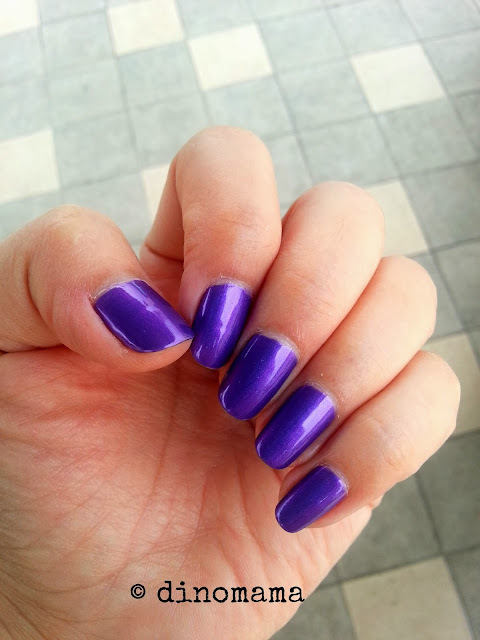 When MummyMoo asked me to join her for a session at her regular nail spa Pinkie Nails I decided to give it another try as I've admired her oh-so-pretty nails since the day we got acquainted, on top of that I suddenly feel the need to pamper myself. Well, I was not disappointed and I truly enjoyed the 2.5hrs sitting on the comfortable sofa while my hands & feet are being pampered by the friendly & cheerful manicurists. My pretty nails in the royal purple color. Manis & Pedis are the best. They make me so happy and obviously the best part is the MASSAGE portion! I will typically BUY EXTRA massage time! LOL!! Definitely do that next time, especially if you're battling a lot of stress. Ah~ great suggestion GiGi~ I'll remember that IF there is a 3rd or many more times. I usually do my own nails, since I'm in the salon I thought why not choose a nail color that I do not have in my collection. Purple has been one of my favourite color so purple it is then.